Last week I showed you Santiaguero and Pilato masks by Narciso Iturbide Charo, a wonderful carver from San Antonio Rayón, Puebla who died in 1996. Today I will feature four of his three faced Santiaguero masks. These are probably extremely rare; approximately 17 of these were initially collected in the field in the early 1980s and I am not aware that any more have turned up in recent years. It seems that no two of them were the same. In about 1980 my friend Robin Cleaver found an unusual mask in the city of Puebla; the folk art dealer who owned the mask was in the process of stripping off the “ugly red paint.” The mask was very unusual because it had three faces. I will call this the index mask. Robin purchased the mask and learned the name of the place where it had been found. In a partnership with Jaled Muyaes and Estela Ogazon, Robin and his wife Barbara sent a runner to that town with a camera, and although the camera stopped working during the trip, there was one clear photo on the film roll. This showed Santiaguero dancers in action, wearing traditional costumes, Morion headdresses or paper crowns, and masks with three faces. In this local variant, the morion headress is worn by a Santiaguero and the crowns by Pilatos, yet all wear three faced masks of the same color. A set of about 16 masks was brought out on the backs of mules over mountain trails, as there were no roads to this community at that time. Here is the dance photo that accompanied the masks. According to Manuel Antonio Castañeda, the dancer wearing the green Morion headdress and the apron of bells is Narciso Iturbide Charo himself. Later I will show you his mask. In the last three posts I have provided a comprehensive overview of the Santiagueros dance. Today I will focus on Santiaguero and Pilato masks by a single carver, Narciso Iturbide Charo, of San Antonio Rayón, Puebla. In an older post that compared decorative (meaning invented, non-traditional, and falsely presented) masks with somewhat similar masks that are traditional and authentic, I included one of the three-faced Santiaguero masks that was carved by Narciso (see my post of August 25, 2014). Those three-faced masks will be the subject of next week’s post. Narciso Iturbide Charo was born on August 6, 1921 and died on March 18, 1996, at the age of 74. He lived and worked in the mountain town of San Antonio Rayón, Puebla. He not only carved masks for La Danza de los Santiagueros, but he also performed as one of the dancers. His friend and fellow carver, Manuel Antonio Castañeda, whom you met in last week’s post, was a musician for those dances; he played the flute. Narciso’s carving style was highly distinctive, so that after I saw masks of his that had been preserved by one of his sons I was able to reliably identify many others that had been undocumented. It helped that Narciso had developed his own ear design, a practice that was frequent among his generation of carvers. An unusual aspect of Narciso’s masks had to do with their size or scale. One finds two populations of Santiaguero masks by this carver, one group of oversized masks and another group that are closer to the size of most Santiaguero masks by other carvers from this region. The three-faced masks that will appear next week are of the larger size. I will begin with the pair of over-sized Santiaguero masks by this carver that I purchased in 1987, just as I was beginning to collect Mexican masks. I didn’t learn that Narciso was their carver until about 20 years later. This mask measures 13½ inches in height, 8inches wide, and 4¾ inches in depth. 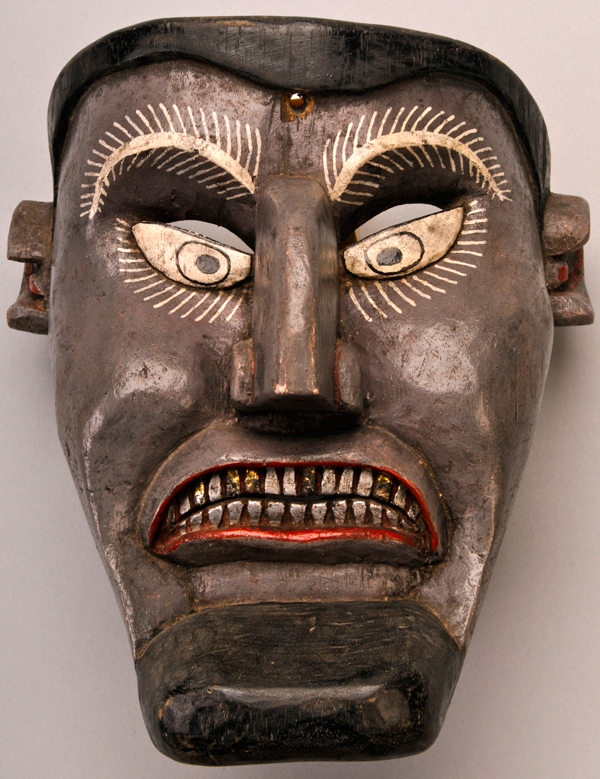 The toothy grin is a prominent feature of the masks by this carver. This is the third post of an ongoing series about La Danza de los Santiagueros. In the first post I discussed Santiago and his son, Callintsin. 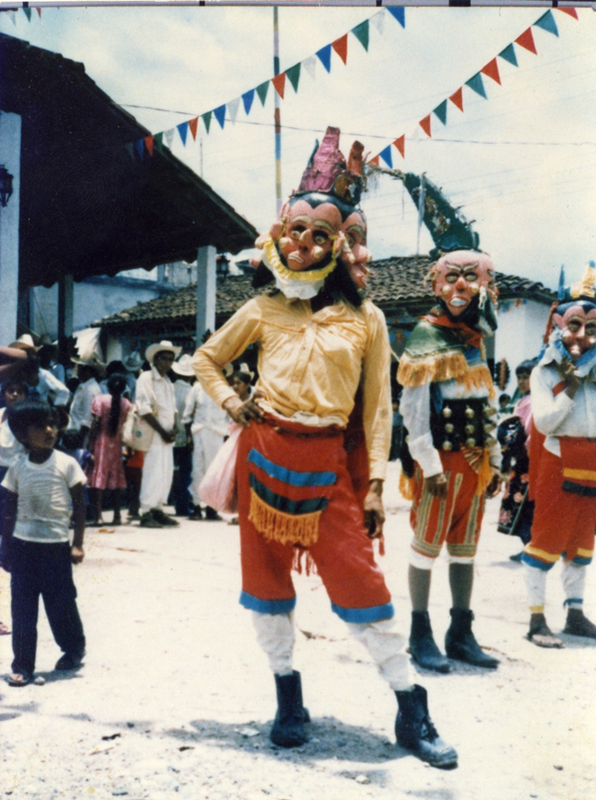 Last week I wrote about the Santiaguero dancers, their masks, and other costume elements. Today I will describe the masks and related equipment of the Pilato dancers and that of their leader, Pilato el Presidente, using the work of one carver. Next week I will look at masks of Santigueros and Pilatos by another carver. To very briefly review and then elaborate on some points that I have made in the last two posts, this is a dance that writers tend to describe as an alternate form of the dance of the Moros y Cristianos, a dance that is about events from the past. However this dance is not about historic events, instead it portrays a patched together and largely invented history that is meant to camouflage its apparent hidden purpose, which in my view is to complain to God about the exploitation and injustice that the Indians of Mexico have experienced at the hands of the Spanish and to ask God for relief. It is the Pilatos and their leader who are demonized in this dance, but the dancers used such labels to disguise their intention to criticize the Spanish. Here is a mask of Pilato El Presidente, the leader of the Pilatos, that was carved by Manuel Antonio Castañeda of San Antonio Rayón, Puebla. In my book I speculated that this mask represented the Pilato character in the Negritos dance, but now I realize that I have seen about ten masks carved by Manuel to be worn by Pilato dancers in the Danza de los Santiagueros, along with one Santiaguero mask, and this scowling mask; apparently Manuel only carved masks for the Santiagueros dance. This Pilato is depicted as an extremely menacing figure. He can be presented as either menacing or with a serene smile. This carver has such a dramatic style. This face seems inflated and yet sagging. This week we will examine the masks and other costume elements that are worn by the Santiaguero dancers. I should begin with a brief discussion about names. This dance can be called the dance of the Santiagos or the dance of the Santiagueros. Either of these names seems to mean “a follower of Saint James, or Santiago.” Therefore the mask worn by one of these characters can be called a Santiago mask or a Santiaguero mask. I prefer to speak of Santiagueros and Santiaguero masks to avoid confusion, because “Santiago mask” can be easily misunderstood as a reference to a mask worn by Santiago himself. 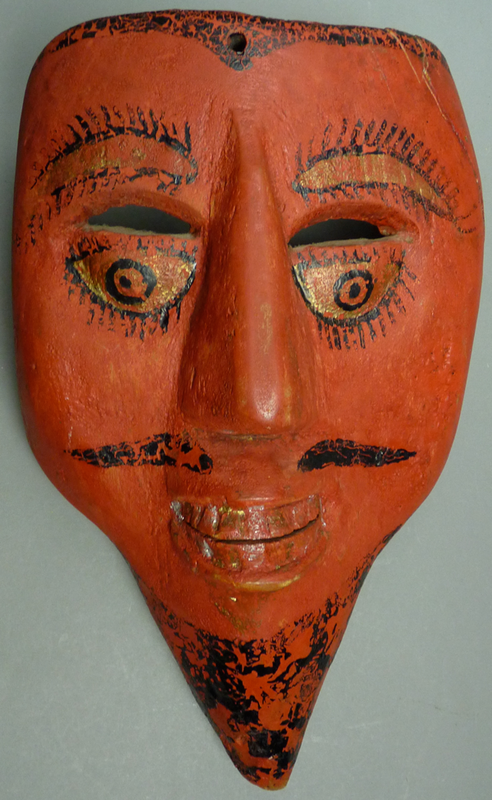 This ambiguity leads sellers and collectors to think of all Santiaguero masks as having been worn by Santiago, even though this character rarely wears a mask in contemporary performances. Last week I included a dance photo of Santiago. Here is another Santiago, preparing to dance, in the town of Zoatecpan, Puebla. 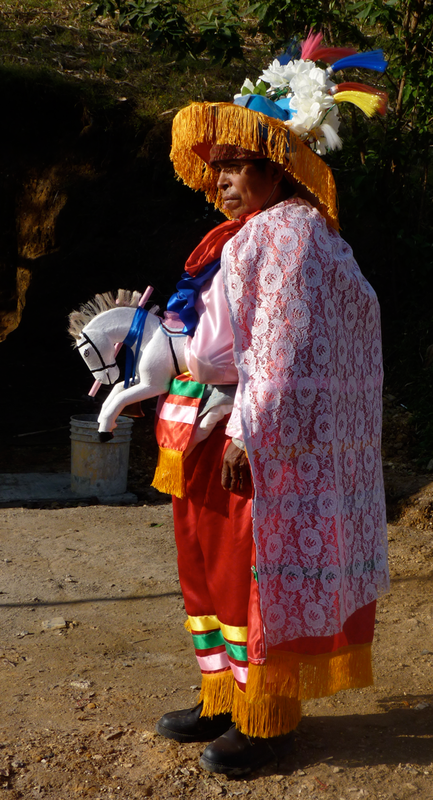 As usual, this Santiago has an elaborate hat and costume, he wears a wooden dance horse at his waist, and he does not wear a mask. In one hand he carries a wooden cross, which is barely visible behind the horse’s head. He would carry a wooden sword in his other hand, but this dancer hadn’t picked up his sword at the time of the photo, as the dance hadn’t started.